Zampone and Cotechino are traditional meat products often served as a main course on Christmas day or New Year’s Eve. What do people eat in Bologna during this time of the year? We’ve previously mentioned some of our habits, such as Certosino or Tortellini, but today we’re going to continue talking about food coming from Modena, just like Aceto Balsamico, on which we’ve spent a few words last time. Zampone and Cotechino are traditional meat products often served as a main course on Christmas day or New Year’s Eve. In general, they are sold and consumed all throughout the holidays. They are slightly different from each other and, though they may not be the lightest product in the world, they are very tasty. Back in 1511, when different Italian regions were still fighting over land and power, including the Vatican, Pope Julius II ordered an attack on Modena and the adjacent cities. The town of Mirandola decided to take precautions and slaughter all their pigs, so the papacy wouldn’t rob them. To preserve the meat, they decided to stuff it, first, into the rind (cotechino), then, into the foot (zampone). Nowadays there are also other differences between these two products regarding on the production method and type of meat. They are often served together with mashed potatoes or lentils, and while the first combination is merely based on taste, the second one has a story behind it. 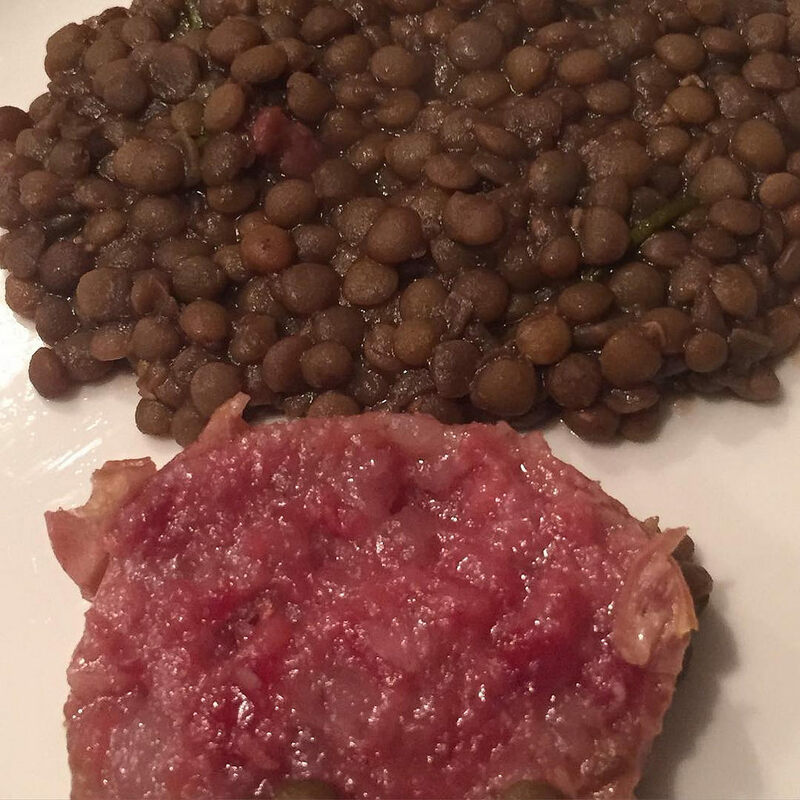 Lentils, because of their shape resembling coins, are traditionally served together with zampone or cotechino on New Year’s Eve, as some sort of lucky charm to wish people a good year, financially. Lastly, we’d like to mention another type of cold cuts you probably haven’t heard of, from the nearby city of Ferrara: the Salama da Sugo. Dating back to the 1500s, and originally appreciated by nobles and aristocrats, it has gradually become a more affordable food for regular people to eat during festive and special occasions. It is, for certain areas, an alternative to zampone and cotechino, though it is very different. It is a peculiar type of cold cut, prepared starting from different types of pork meat blended with spices such as clove, cinnamon and nutmeg; it is then seasoned for 6 to 24 months. The Salama is usually served with red wine, which exalts its traits and flavors, and has recently been recognized by the EU as an IGP product (something we talked about last week). If you want to know more about the traditions we have in Bologna during this time of the year, take a look at all our articles and, mostly, feel free to drop us a message and come on one of our food tours!